This is certainly one difference, and it deserves to be improved upon. I am not sure about all the claims, but as I said: "refreshing." Johannes Schmidt: Der Zettelkasten als Zweitgedächtnis Niklas Luhmanns is a video of a lecture given by Johannes Schmidt that provides a very detailed description of Luhmann's Zettelkastn. I learned many new details (without having to revise my earlier views). Warning: The lecture is in German. Searching Epictetus's texts themselves (or rather Arrian's account of the teachings of Epictetus, as we have no texts by Epictetus himself), you will not find this "quotation." It is actually from a rather dubious edition of Epictetus, namely by The Art of Living. The Classic Manual on Virtue, Happiness, and Effectiveness by Sharon Lebell. The subtitle of this work is "A New Interpretation by Sharon Lebell." It is a translation only in the loosest sense. As Lebell points out in her "Prologue", "I have done my share of selection, interpretation, and improvisation with the ideas in the Enchiridion and the Discourses. ... My aim has been to communicate the authentic spirit, but not necessarily the letter, of Epictetus. The passage in question, found in the section on "Essential Teachings on Virtue, Happiness, and Tranquility," is clearly an example of her "improvisation with the ideas" of Epictetus. It is written by Lebell, not by Arrian, and it is loosely based on some passages in the the Enchiridion and the Discourses. just as if, in forming our opinions, when perplexed between true and false semblances, we should, instead of practically distinguishing between them, merely peruse dissertations on evidence. What, then, is the trouble? That we have neither learned by reading, nor by writing, how to deal practically with the semblances of things, according to the laws of nature. But we stop at learning what is said, and, being able to explain it to others, at solving syllogisms and arranging hypothetical arguments. Hence where the study is, there, too, is the hindrance. Reading may be a beginning, but "we have neither learned by reading, nor by writing, how to deal practically with the semblances of things, according to the laws of nature." Practice is what is called for. To be "a more discriminating and reflective person," as Lebell would have it, would be for Epictetus not even the beginning of living in accordance with nature. The very title of the book includes "effectiveness" as one of Epictetus's goals. But effects are, according to Stoicism not "up to us." Reader beware! And those who consume quotations should be aware that they are not quoting Epictetus, but a modern hash of Epictetus. 2. I am well aware that most people would not care about this distinction! (iii) it's a memory aid ... That enables human beings to store away a piece of information and compare it to a new piece of information and draw conclusions." (iii) seems to me obviously true, but it says nothing about the truth of (i) and (ii). Language can be a memory aid, no matter whether it is invented or a product of evolution. His argument (if an argument it is) would certainly be true of writing which does seem to be a memory aid invented that allows us to store pieces of information, compare them and draw conclusions from them, but I don't know anyone who has claimed that writing is the product of evolution. On the other hand Stanislas Dehaene has shown (convincingly to my mind) how reading (though "invented"), depends on certain structures of the brain that have evolved. "Reading, but also writing, mathematics, art, religion, agriculture, and city life have dramatically increased the native capacities of our primate brains." But we have independent evidence for human beings who could use tools, but who could not write. Whether there ever were beings that were human but who could not speak is an entirely different matter. Aristotle already proposed as a definition of human beings that they are the animal that can speak or have "logos", though he ultimately opted for rationality as the essential characteristic of humans. What language has to do with rational thought is an interesting question; and there is a host of other interesting questions having to do with language. I just doubt that Wolfe has anything interesting to say about it, and not just because of the passage discussed here. The mess he makes of Stoicism in his A Man in Full seems to me independent evidence for this skepticism. I am not going to rush out and buy Wolfe's book. 2. Dehaene, S. (2009) Reading in the Brain. The Science and Evolution of a Human Invention. New York: Viking. "Ulysses News" on "The Future of Note-taking"
Is note-taking writing? In our opinion, the answer is clear: It depends. Jotting down a shopping list may not be writing, but recording secret thoughts and sudden inspiration comes at least very close. Ulysses is a writing app not only for professional or aspiring authors, but also for sophisticated note-takers. That’s why users of the now discontinued Vesper app may consider it as a worthy alternative. Is note-taking writing? I agree: "it depends", but it does not depend on whether you are "jotting down something" or whether you are "recording secret thoughts". It depends on whether you are taking down notes in writing or, let's say, dictating into a tape recorder. Jotting things down is just as much writing as is recording thoughts. In fact, I don't really think that "jotting down" and "recording" are binary opposites in the way the author of this mail suggests. "Jotting down" can clearly be a form of "recording." Can "Ulysses" be an application for "sophisticated note-takers"? Perhaps, but I doubt it, if only because I have tried to use it for that purpose. It just does not have the robust search capabilities that you'd need for long-term note-taking, etc., etc. I am also worried about how well it works with tens of thousands of notes, but perhaps I am not a "sophisticated" note-taker, and someone can enlighten me on the secrets of this way of taking notes. This says nothing about Ulysses as a mark-down editor for occasional use, of course. I do like the application, I just don't like the hype that goes with it. See also here. 1. I am not sure that Vesper was very good at that either. There is no search in the free version which makes it useless for any larger accumulation of pages. You can import rtf and txt files (one at a time), but the program annoyingly adds underscores to replace spaces, so "My page" becomes "My_space", etc. However, if you need a simple and small wiki, it fits the bill. The paid version seems to allow you to search for single words (not for complex expressions). I had not tested CintaNotes but relied on someone else's testimony when I wrote the previous post on it. 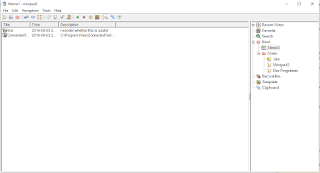 So, I thought I would actually test it with my approximately 10,600 text files from ConnectedText. The short of it: I couldn't. CintaNotes uses its own file format (*.db). You can import db, and xml files, no txt files. It has a selection for "All files", but it does not recognize txt files. So I could not import the notes I used in ResophNotes and nVALT. This means that I could not test CintaNotes due to its limitations in import. For what it's worth I used an SSD drive for all the tests. My notes are small, most of them 500 words or less, and I did not even test search in ResophNotes. Just moving around between different files and trying to change a word or two was too slow already. 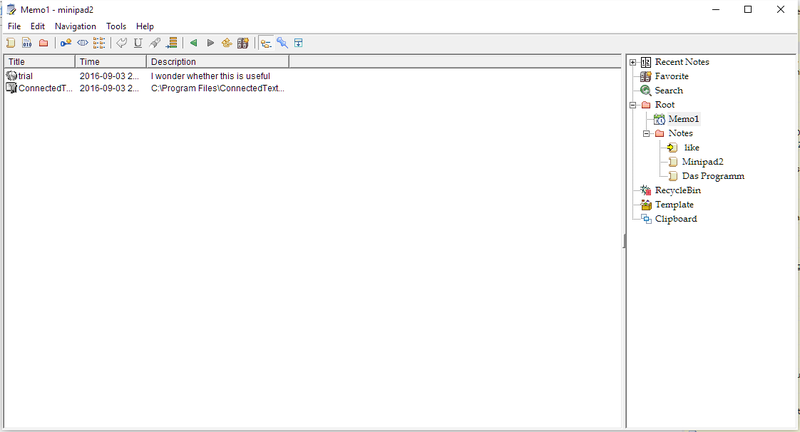 I was going to try xml import, but then I found in the help file: "You can import notes using the File/Import command. You can import notes from previously exported XML files and from other notebook (.db) files." So, there does not seem to be a way to import any notes taken in any other application before. This makes the application useless to me (and, I suppose, to many other people who would like to migrate to CintNotes from any other note-taking application.) I have, accordingly, deleted CintNotes from my machine again. Let me just say that the inability to import text files seems to me a more serious limitation than ReophNotes limited ability to handle a large number of text files. I came across RGDot, a freeware blog that lists many note-taking programs. There were two programs that caught my attention: Redhaven Outline and minipad2. I downloaded minipad2. It was not easy, as it has not been developed since at least 2011 and most of the download sites seem to be more interested in installing other crap on your computer than simply letting you download the program you really want. I like it! It's very small at 350 KB, but it does a lot of things apart from textual notes that can be linked to each other. Some of these things are not interesting to me, like the calculator and dictionary pages that you can create. Others are most interesting, like the memo function that allows you to set a note to pop up at a certain time or at regular intervals, and even allows you automatically to run other programs from those notes. I also find the link page that allows you to store links to files, programs, or directories. It runs links to ConnectedText topics, like these "ct://Personal/Redhaven%20Outline" as well (which I especially like. "It is also capable of watching the clipboard and inserting pre-defined text such as time, date, separator and signature – which can be defined via the Tools—>Edit Template menu. New tabs can be created for separate notes and aforementioned included functions." I think this is another strength of the program. I can't believe that I missed it for such a long time, and I think it is worth a trial even though there does not seem a chance that it will be developed further. I tried ResophNotes yesterday on the more than ten thousand notes exported from ConnectedText. It worked, but not very well. It took a while for notes to open. Clicking on a link eventually opened the target note, but it took unacceptably long (even though I have a quad-core processor). Christian Tietze reports that this behavior starts with about 1500 notes (see his comment on the previous post). I would suppose that this slow-down depends at least to some extent on the processor and memory specification of your system, but I also think that it is unacceptable for a large body of notes. More than 20,000 notes are not unheard of for a life-time of note-taking, even if you do not just copy web pages but take careful notes. Thus, Jules Verne amassed 20,000, Luhmann seems to have ended up with about 90,000. Roland Barthes with 12,0000, and Hans Blumenberg with 30,000. In any case, it does not seem unreasonable to expect a robust note-taking or Zettelkasten-system to handle a large number of notes (with headroom to spare).